Finally a new dvd with unreleased footage out soon from STAR label. A brand new release which includes some amazing stuff, all presented in Widescreen. Starting just like the "original" release with an alternate version of "Walk A Mile.." this time the August 12 M.S. version is used, and it looks more complete then ever. A great way to start the "TTWII - treasures" segment, which includes some ultra rare, hard to find camera angles, in an amazing new sound. Next up is a special "Iso Cam" recording NBC did for their 1968 "Elvis" TV Special. They used an "hand-held" camera to fill in gaps or production errors. Seeing the show as a continues feed from one hand-held camera captures the live experience of this June 29th, 6 pm show like never before. Of course the sound of the tape has been edited with excellent sound. "Live in Texas" includes unreleased performances of "Suspicious Minds" , "For the Good Times" although the footage has some anyoing text in the picture, STAR managed to get that to the background, so it is a better viewing experience. The program ends where it started, and some more cool TTWII rehearsals for you to enjoy! As a special bonus three tracks from the "STAR" release "If I Can Dream" are included. Also as a bonus some UNRELEASED footage from "Greensboro" is included, the text here is very annoying, but it does however has "lost performances" of "Love Me Tender" Suspicious Minds" and "For the Good Times" all never released before! The Lost Performances released officially on DVD alone will do and is long overdue. I prefer this kind of stuff from Star as opposed to their made up song videos. 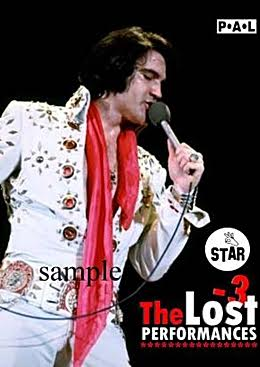 If Warner aren't going to release a TTWII or EOT box set then they should release the Lost Performances on blu ray at least.